Today is Veteran's Day, which of course originates from the anniversary of the day the Armistice that ended the fighting during World War I was signed. 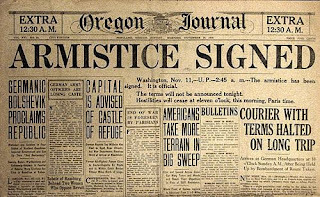 One of the things you hear constantly during the coverage of Veteran's Day commemorations is that the Armistice occurred at the 11th hour of the 11th day of the 11th month. 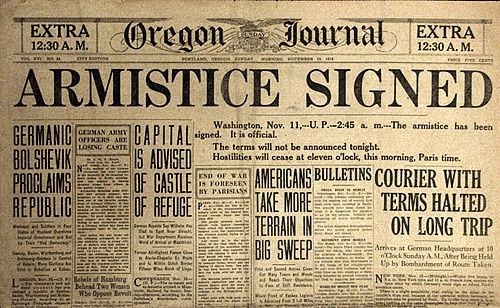 Technically that's correct because the Armistice didn't take effect until 11 AM, but the truth is that the Armistice was actually signed shortly after 5 AM the morning of the 11th of November. However, for symbolic reasons the announcement of the Armistice was delayed until 11 AM. During that delayed ending, fighting continued and in many cases even intensified. Some commanders, knowing the war was within hours of ending, ordered their troops to attack the other side in one last stab for personal glory and bragging rights. The rational for others was even less reasonable. Many allied artillery units continued firing upon German targets in order to avoid having to haul the left over ammunition away. In one particularly heinous instance, General William Wright of the American 89th Division ordered his men to capture a nearby town so that they could use the shower facilities there after the Armistice took effect. There were over 300 unnecessary casualties during the resulting battle. Even in instances where commanders didn't order their forces to engage in a last minute, ego inflating skirmish, the simple fact that the cessation of fighting was delayed resulted in soldiers dying who otherwise would have lived. Just one such example is Augustin Trebuchon a French soldier who was killed by sniper fire at 10:45 AM while delivering a message to his fellow soldiers that soup would be served after the cease fire. All told 10,944 casualties, including 2,738 killed, were recorded between the time the Armistice was actually signed and the time it went into affect. 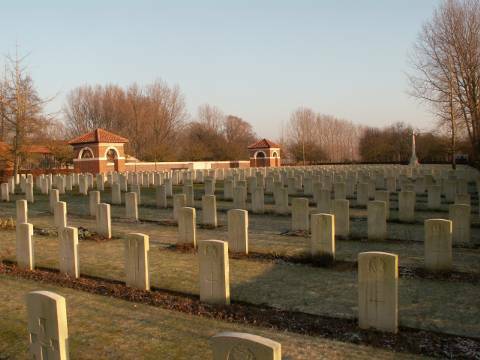 A lot of people died for no other reason than so that the official Armistice could be recorded as the 11th hour of the 11th day of the 11th month. That is admittedly much cooler sounding than the 5th hour of the 11th day of the 11th month, though. Update: Via Anarchologs I came across another post on this subject at Roderick T. Long's Blog. His post includes a link to "World War I Wasted Lives on Armistice Day", a somewhat long and well written article that contains many more details about that final day of unnecessary combat. Thanks for posting this. This is a very important and revealing story. I always appreciate feedback from you. It is rather amazing that the disdain the Government has for the troops they claim to care so much for.